Smart Tech E LTD - The Best quality of plastic or metal prototypes in china! new client vist us this day! SMARTTECH are a rapid prototyping,metal punching product and plastic mold and modling company, based in HongKong with branches in Shenzhen city and DongGuan city. SMARTTECH is a leader in the domestic business field and is also highly competitive within many international markets. Shenzhen company was founded in May, 2006. Meanwhile, we are further developing international sales branches in Shenzhen and DongGuan. The development team has increased not only the number of staff but also the significant skill base. These include professional quotation operators, designers, figure file operators, and also several sales representative's fluent in English, Japanese, French, etc, providing the most professional relative services for the clients all over the world. Many industrial design and rapid prototyping companies from South Korea, Japan, India, Canada, United States, United Kingdom, Norway, Czech, Slovakia, Australia, New Zealand have established long-term business relationships with SmartTech. Also SMARTTECH are a professional one-stop R&D engineering service provider, not only we were formed by a group of people who owned many years of practical R&D and manufacturing experience, but also we have the resource of special equipments and instruments for prototype PCBA making , testing and analyzing, product mechanical-structure prototype and tooling service, this will be a great help for your R&D departments, and increase the speed and effectivity for your new product development. Our service includes Product R&D prototype engineering service and added-value R&D engineering service. 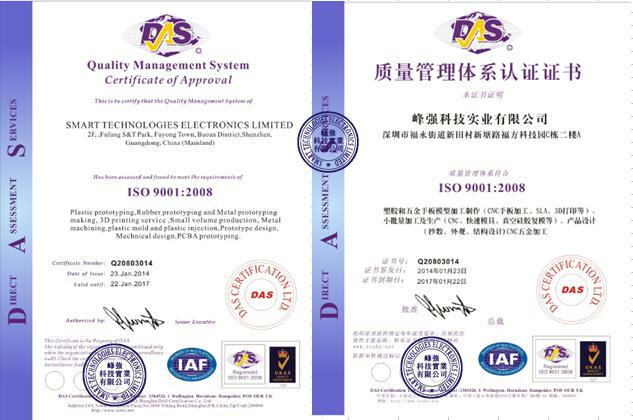 We operation complies with ISO9001 quality system instruction and requirements since Oct, 2008. SMARTTECH design has invested in advanced technologies and highly skilled work force. With these assets, we can model out of a very wide variety of materials including many sorts of plastics such as ABS, MABS, PMMA, PVC, PC, POM, PP, PA, PPT, PE etc. Of course the same is true for as many metals including stainless steel, aluminum and copper. Rapid prototyping is typically referred to as an additive fabrication technology because the process involves building up the object by adding successive layers. This process involves providing CAD drawing information to the rapid prototyping machine, which uses that data to incrementally create the object. This is different than traditional subtractive methods such as milling, turning, EDM, etc. Subtractive techniques begin with raw material that is larger than the object to be created and material is removed or carved out to create the object. Through comprehensive examination and extensive testing we can meet our customer's requirements for new product appearance, enhanced performance and robust configurations, offering quality products, which helps to shorten the development cycles and reduce the risk of tooling rework, as well as raises the product quality. Upon requests, we can carry on small batch production, Model appearance after treatment steps, the painting and electroplating samples can be prepared for display and market promotion, enabling our customers to pre-empt the market and reduce the consumption cost of development.